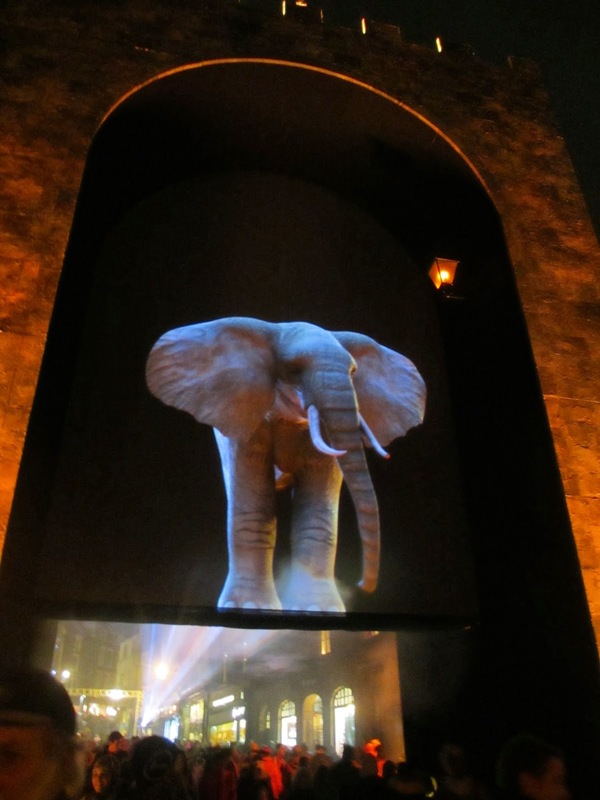 The projection of a giant elephant engaged in continuous very loud stomping and trumpeting, stalked the streets of Durham this weekend in the city’s third ‘Lumiere’ festival, which lights up the city by night with light based art installations. 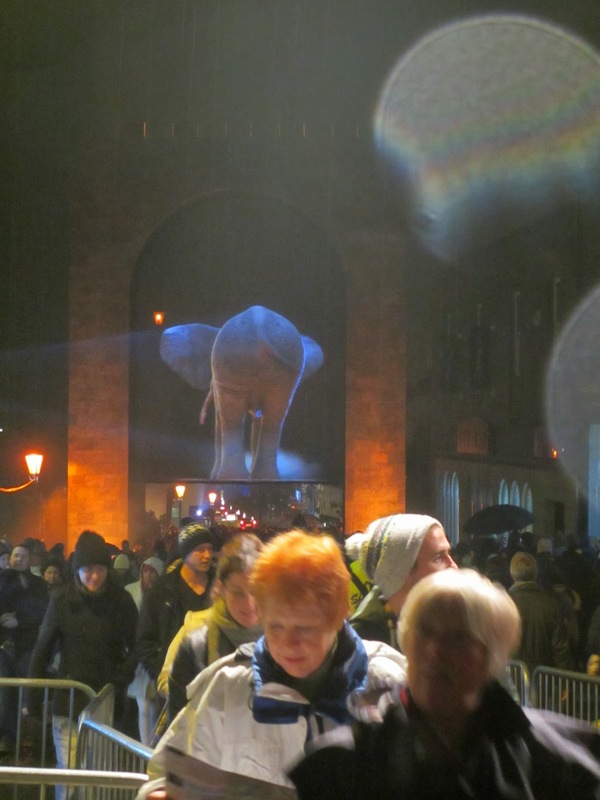 I did wonder what the elephant had to do with anything but it’s creator says ‘It invites the audience to explore urban landscapes, and challenges how people think about and use public space.’ OK? 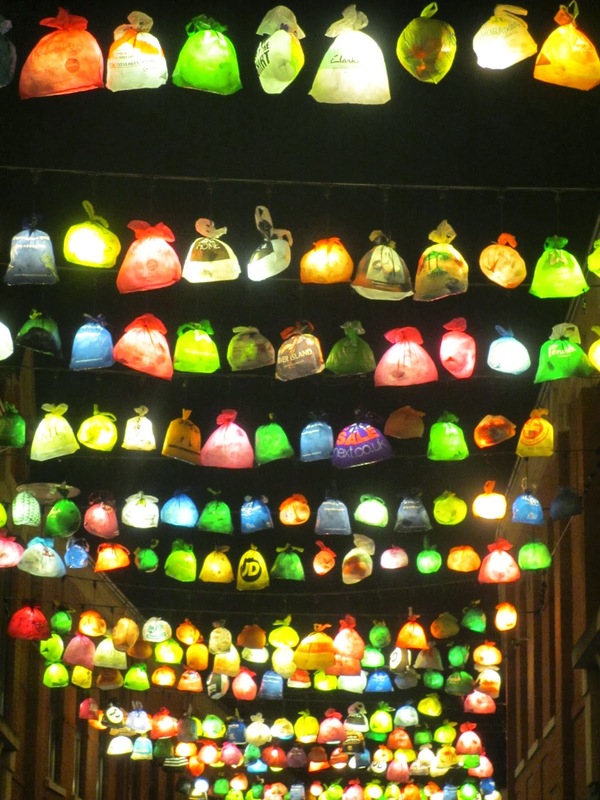 Festival organisers, the Artichoke project, said: ‘Lumiere will weave a nocturnal art trail through the city, engaging with its architecture.’ And indeed, if you could actually get to see the things as you contended with the other 175,000 visitors who were crammed into the winding streets of the charming medieval city, that may have been the case. However, it was more of a push, shoving/shuffling forward than a weaving really. A victim of its own success, the event was apparently much better organised in terms of crowd control than in its first year where the volume of crowds bottled necked in, started to get a bit scary. Also it’s free, which does tend to encourage participation, although this is not a cast iron guarantee. The event, which ended on Sunday after four nights, featured 27 light installations beamed on to buildings, including the city’s Norman cathedral. I think we managed to see about half of them before we gave up battling the crowd and went home. 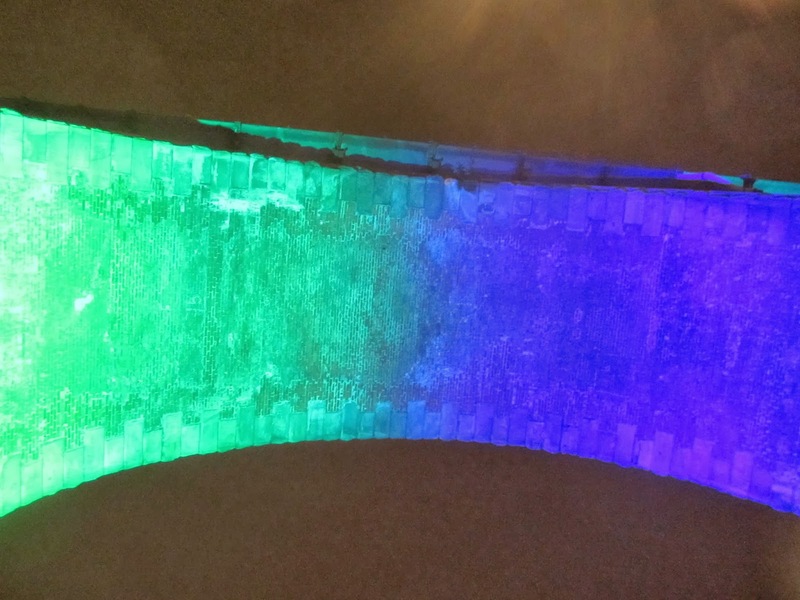 The railway arches were beautifully lit from underneath in blue and green (why don’t they do that all the time?) and they looked especially jolly when the trains went over them. 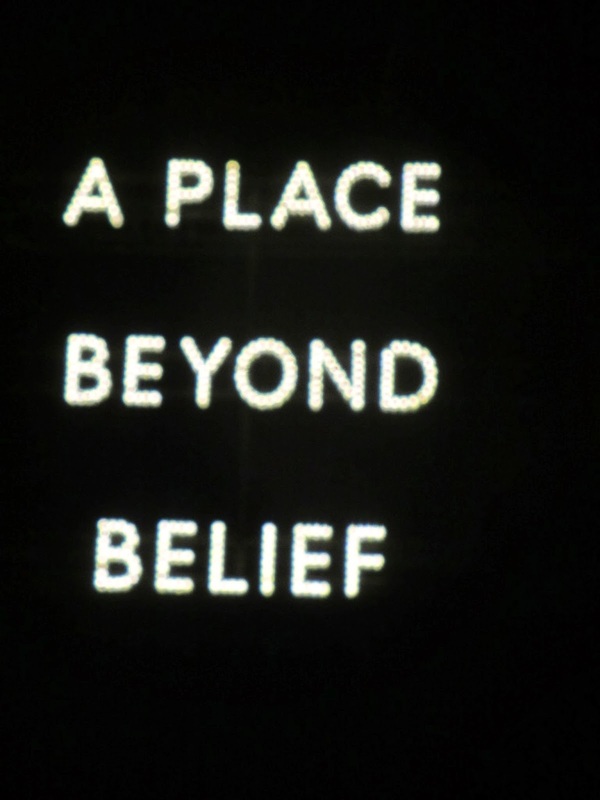 Roundabouts were illuminated and meaningful messages blazed in the darkness. This year, to spread the crowds, the festival extended opening times and used a free ticketed system during peak hours in the central area.The Park and ride system was very well organised I have to say, the bus ride in was the easy part. 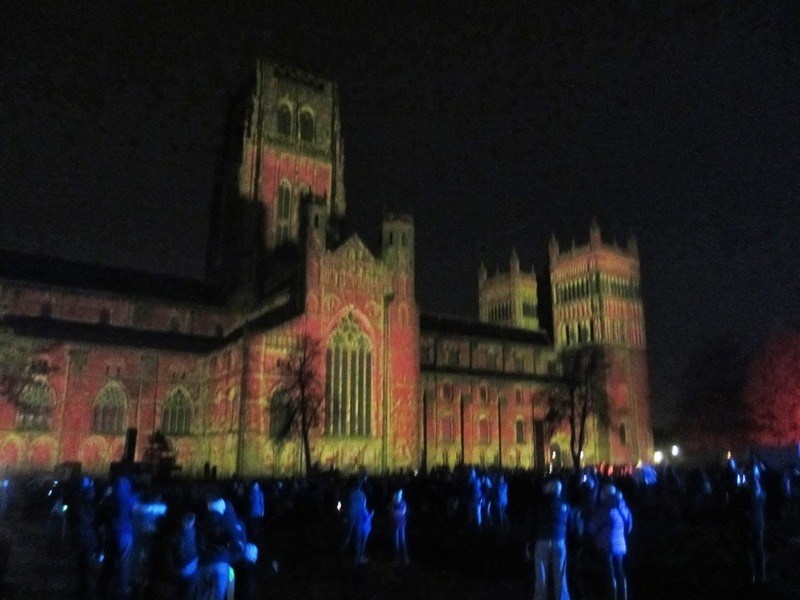 Durham Cathedral had light projections beamed on to it as part of the festival which was reminiscent of the Son et Lumiere which they do so well in Europe. Images of vikings and the Lindisfarne gospels rose up the facade of the Cathedral to rousing music. The display was called the ‘Crown of Light’ by Ross Ashton and I really enjoyed that part of my visit. I do think that Durham Cathedral is the most beautiful in the world though, so I am a bit biased. There was stuff going on inside the cathedral as well but I haven’t seen a queue that long since the new Harry Potter ride opened at Universal Studios in Florida. So, after trying to sneakily push in and being dismissed roundly to the back, we slouched off, slightly disgruntled. The artworks apparently included an interactive model of the sun 100 million times smaller than the real thing, by artist Rafael Lozano Hemmer. It was so small, in fact that I missed it completely. No idea where that was. 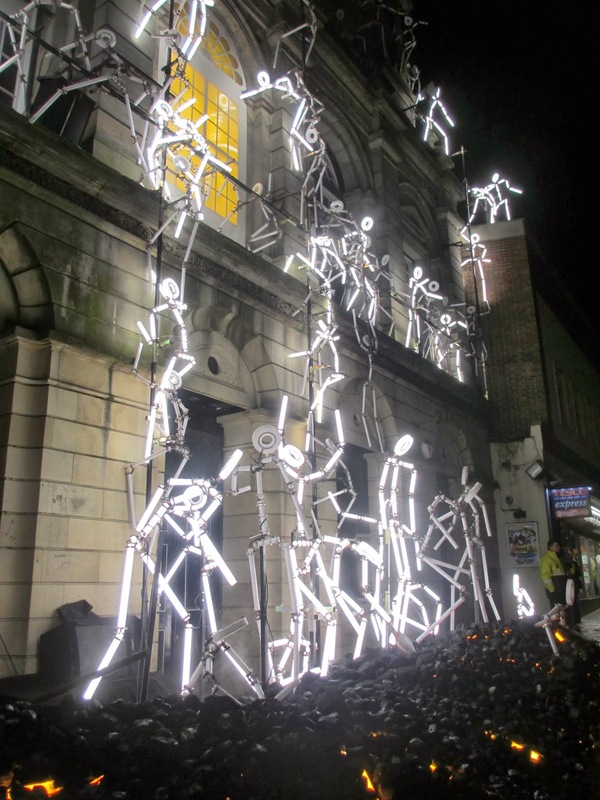 My favourite installation was an animation in which LED stick men miners took over what used to be the Durham Miners’ Hall to the beat of a Durham Brass Band. The base of the sculpture was obviously meant to be a mine with coal and steam coming out of it and the figures were cleverly lit in sequence to simulate movement up and down the building to various sound tracks including some recordings from the miner’s strike and finishing with a rousing blast of ‘working in a coal mine.’ It was witty, very cleverly done and had local relevance. Top marks for that one. One of the installations featured illuminated shopping bags which made up strings of lights across the shopping arcade street and a plastic bag Christmas tree outside British Home Stores. I think it was something to do with a recycling message. Very pretty. The festival was commissioned by Durham County Council and sponsored by Arts Council England. It certainly brought lots of people into the city centre and one presumes the restaurants and chip shops and pubs were beneficiaries of all these extra folk milling around with money in their pockets. 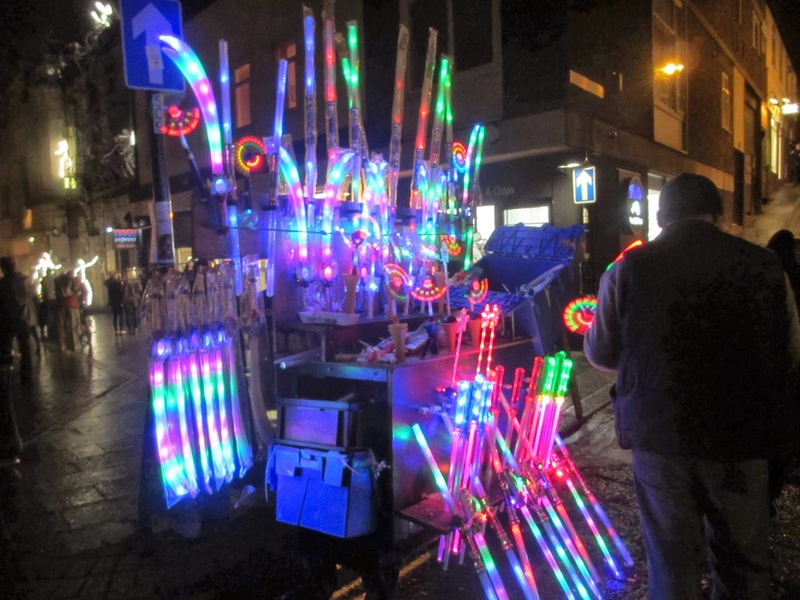 You have to offset the fun of the light sculptures with the crowds verging on the unpleasant and the organisers shouting at you to ‘keep moving forward’ in a manner more akin to evacuation at a police incident rather than a magical discovery of artistic delight. So would I go again? Maybe I would. It’ll be all light on the night.. Step away from the rear of the elephant! 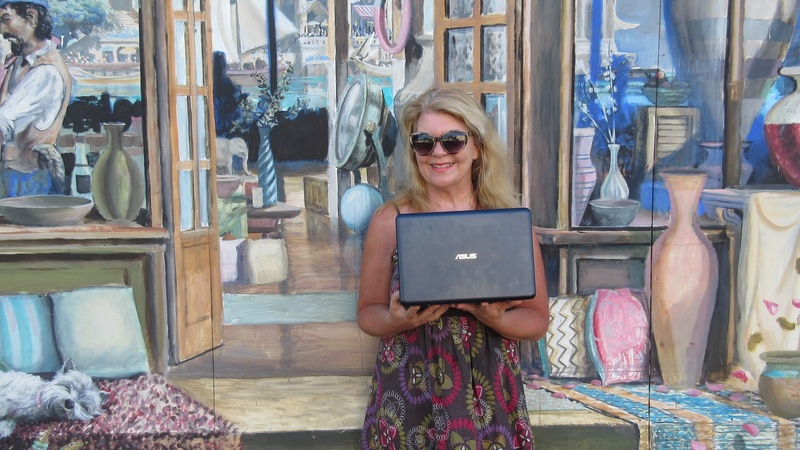 Previous Post:Carnaby Street – the musical!